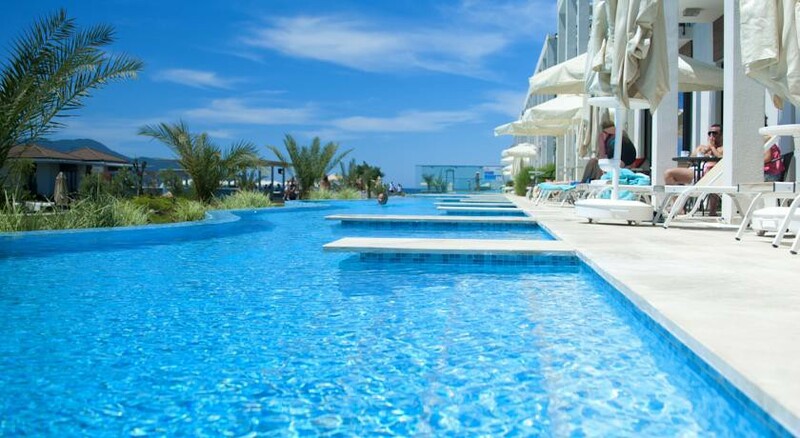 Situated right on the beach of Calis in Fethiye, Jiva Beach Resort is a perfect blend of relaxation and luxury. With the 5,000 sq. metres natural lagoon located at the centre of the resort, guests are guaranteed wonderful views of the Med and great sunsets. This five-star all-inclusive hotel provides a host of villas, suites and pool rooms overlooking the gardens, pool and the blue sea. With restaurants and bars preparing Turkish and international delicacies, private beach with sunbeds and bar services, relaxing swimming pools, plenty of watersports, rejuvenating spa, Turkish bath, water slides, sports activities, pool parties, evening shows and Turkish hospitality, Jiva Beach Resort Fethiye offers you an unforgettable holiday. For families, the hotel provides a number of amenities such as family rooms or suites, game centre, aqua slides, mini club, kids’ pool and entertaining activities for the young ones. 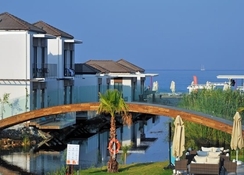 Jiva Beach Resort is located directly on Calis Beach surrounding a natural lagoon. It is about 5 km from the heart of Fethiye on the coast of Turkey. The hotel boasts a private beach, but if you want some more of beach life, the world-famous Olu Deniz beach is only 30 minutes away (around 20 km). The Calis town centre is just a kilometre from the hotel, while the Dalaman International Airport is 50 km away. Calis has its own water park that will keep water lovers engaged, and parts of the beach are popular with the local turtle population, who come in to lay eggs in the sand, much to the delight of nature enthusiasts. The environment-friendly architecture at Jiva Beach Resort with one and two storeyed buildings will make guests feel unified with nature. There are 367 rooms and suites that offer garden, pool or sea views. The guestrooms categorised into Standard Room, Family Room, Pool Room, Attic Room, Family Suite, Corner Suite, Honeymoon Suite and King Suite can accommodate up to three or four guests and provide various doses of luxury. The rooms have a range of amenities that include satellite LED TV, direct telephone, air conditioning, safety deposit box, fully equipped private bathroom, hairdryer, minibar, free Wi-Fi, 24-hour room service, tea and coffee making facilities, sitting corner and a balcony or terrace. The swim-up Pool Rooms are on the ground floor and have a direct pool access. 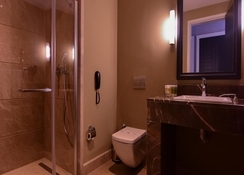 Some of the suites have added amenities like Jacuzzi and private pool or garden. Acacia, the hotel’s main restaurant offers an all-inclusive buffet service for breakfast, lunch and dinner, as well as afternoon and midnight snacks, while drinks are served to your table. Among the a la carte restaurants, Bubon is located in the middle of the lagoon like an island and serves Greek, Turkish, French and Italian cuisines. The Roof Restaurant is the perfect place to enjoy Turkish delights amid amazing scenery. 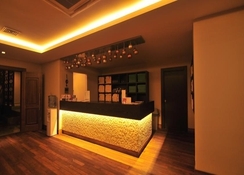 The hotel’s all-inclusive food concept also extends to its Snack Restaurant that offers a wide variety of light bites. The Pool Bar has a choice of local alcoholic drinks, beer, wines, tea, coffee and soft drinks. Lukka Lounge is a 24-hour food and drink option with a variety of bakery items, patisserie, night snacks and soups available. 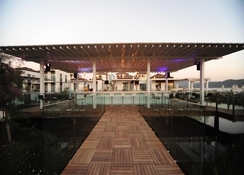 Another architectural gem of the hotel is the Lagoon Bar built on the lagoon like a pier – an ideal place to watch the sunset with a cocktail in hand. Guests can also enjoy cocktails at the beach bar and fresh fruit juices at the spa bar. There are a host of leisure and entertainment options at Jiva Beach Resort to keep you engaged from dawn till dusk. Guests can lounge on its private beach right outside the hotel where you’ll be provided with sunbeds, umbrellas, beach towels and bar services. The hotel has six swimming pools, including kids’ pool, slides pool, Jacuzzi pool and an indoor pool inside the spa. There’s a game centre for every age group that comes with PlayStation, air hockey, billiards and many other games, an aqua park with five slides, mini golf, beach volley, aerobics, yoga, Zumba area, boccia, dart and bundles of other indoor and outdoor activities. The on-site spa offers everything from sauna and Turkish bath to Jacuzzi and massages. Even the little ones (4-10 years’ old) are offered educative and entertaining activities at the hotel’s mini club. Evenings at Jiva Beach Resort Fethiye are equally sizzling with night shows at the 400-people capacity amphitheatre, acrobatic shows, dance groups, authentic Turkish nights and themed parties every night. We would like to inform you that Standard Room(PoolView,Balcony,Promotion) is located on the Attic at “JIVA BEACH RESORT”. Me and my partner had a week away at Jiva beach and all I can say it was absolutely amazing. Clean, friendly and welcoming. The choice in food and drinks were amazing and we would 100% go back got another visit, this time with a swim up room! Don't miss this, You won't regret it. What a wonderful break we had, the standards of this hotel are fantastic, great room, great staff and a beautiful hotel. Stayed in MAY '17 - in a swim up pool room with terrace very lovely , perfect room ,spotlessly clean with a bathroom to die for !! The resort was so lovely too with water gardens in the center & super bars set around the water gardens & 1 minute to the beach . with a great pastry cafe for tea , & cakes etc "YUMMEE". The food was of a most acceptable standard ,something for everyone , the desserts were excellent & the Honey Drenched Baklava's were something else !! There are 3 negatives : you will put on weight !! , a room not too close to the pool is a better option as the music is sooooo loud & a bit rappy if you know what I mean & finally the prices in 2018 /19 seem to have escalated out of all proportion which make the holiday maker trawl the much more expensive hotels in Turkey of which there are hundreds to chose from . However the JIVA BEACH is a great hotel and far exceeded my high expectations - price aside if you do decide to book this hotel for sure you will not be disappointed . Lovely hotel, very clean. Although it was fully booked and busy, it never felt crowded. There were enough pools and the private beach to find a quite spot to relax in. The choice of food was excellent and the waiting staff were fantastic. My only complaint about my holiday would be I paid for a suite room but was given an attic room. I did take this up with the hotel reception staff, but they were unable to change my room, due to being fully booked. I was not refunded and wasn't able to get a late check out ( due to flights not leaving until midnight )either. I don't let things like that spoil my holiday so took it no further and had a wonderful holiday,even though I paid for a suite rather than a room. Had a marvellous relaxing time at Jiva. Amazing food, professional entertainment and beautiful gardens with a lagoon winding through then. Excellent hotel, staff and facilities, we will be returniing! We had an absolutely fabulous week at the Jiva Beach Resort. It really is 5-star! From the range of food, to the friendly staff and the perfect location, this was an absolute must return hotel - and we are booked again already in October! We pushed the boat out and up graded to a swim up room, which was lovely. We were at the quieter end of the hotel, which suited us well as we were travelling without children, so it was nice to be quiet and close to the beach. The food was really good in the buffet restaurant and the one meal we had in the Asian restaurant was really stunning. We were really impressed by the quality of the entertainment in the evening too. There is something for everyone here. I would happily return!